This is a celebratory lunch for hearty eaters. To make a traditional French cassoulet takes at least two days, and there are quite a few processes, but properly-made it is one of the glories of French regional cuisine. A warning – it needs to be followed by a brisk walk or a snooze in a comfy chair! First and final courses need to be light. Crisp radishes with a smear of unsalted butter and a tiny flake of salt are surprisingly addictive. If this seems a bit too Spartan, extend the platter with other raw vegetables such as inner sticks of celery, fennel, spears of witlof, even tiny florets of cauliflower. Add a few anchovy fillets and some extra virgin olive oil for dipping. Bring it to the table in its earthenware or cast-iron pot for maximum drama. It should have a golden crust with juices just bubbling at the edges. It is traditional in the south-west of France to faire chabrol – meaning to tip a small glass of wine into the last morsels in one’s plate. After this rich main dish a salad of mixed green leaves will be very welcome. Include some wintry tastes such as mâcheor watercress sprigs or some torn friséeor radicchio. The sliced pears will add a touch of sweetness, the walnuts a bit of crunch. Others may want to finish their long lunch with a tiny glass of armagnac or eau-de-vie and for the ultimate indulgence, nibble on one or two eugénies – candied strips of orange peel dipped in dark chocolate and rolled in cocoa. 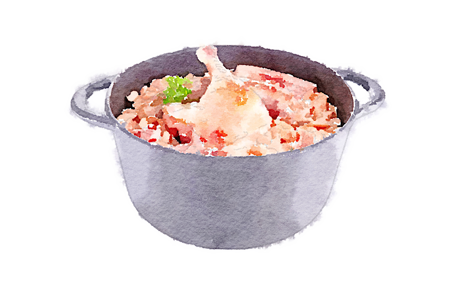 Recipe for Le Cassoulet is from Cooking & Travelling in South-West France. All other recipes above can be found in the Cook’s Companion App or book. Simply use the handy search function in the App to find them by name or main ingredient.